Back at CES earlier this year, we managed to catch sight of the Doxie scanner that looked simply adorable. This is not a scanner which is meant to sit around in your office all day long. No sir, this scanner is meant to be carried around with you wherever you go on your business trips, ensuring that all relevant documents which need to be digitized can be done so in the blink of an eye and right on the spot so that you will be able to paper over the cracks of your forgetfulness. It has taken over 3 months since it was announced and paraded before starting to ship, and we’re glad to announce that you can place an order for the Doxie portable scanner for $129 a pop. Boasting a lightweight, portable design that was built for scanning anywhere, the Doxie scanner is a USB-powered device that has great software as well – it allows you to scan paper directly to PCs, Macs, and web apps like Google Docs, Evernote, Acrobat, and Flickr, ensuring that you will be impressed each time you see “magic” happen right in front of you. For frequent travelers, the Doxie won’t slow you down since it is ultra-light at 10.9 ounces, and requires but a single connection to scan with any PC or Mac since you don’t need to worry about toting around another external power supply. 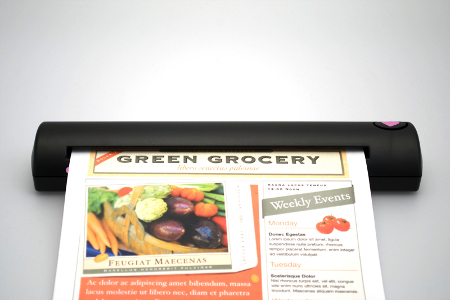 Doxie will scan documents in full color at up to 600 dpi courtesy of its patented scanning technology. Using it is also a snap – all you need to do is press the Doxie Heart Button and it will start scanning automatically. 0 Responses to "Doxie scanner"